It’s a humiliating moment, to be sure. Tripp is riding to school with a bunch of other kids when a classmate pulls up alongside the bus driving a sweet, tricked-out truck, attractive young lady at his side, and shoots Tripp a derisive look. The sting is especially potent because Tripp is a 26-year-old man. 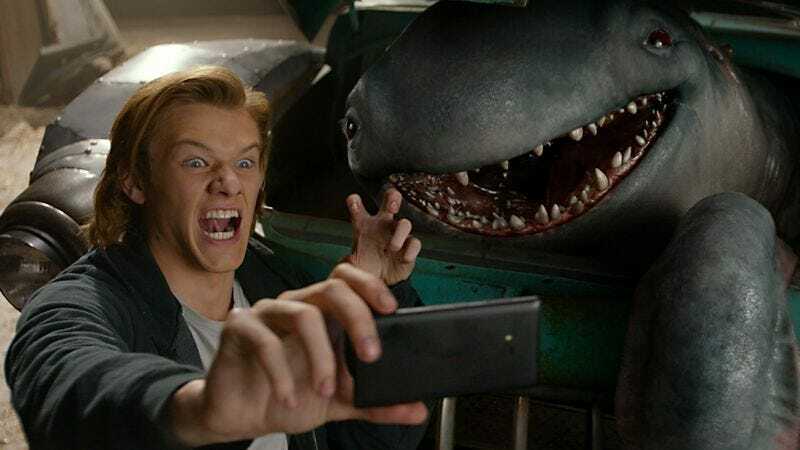 Technically speaking, it’s Lucas Till, the actor playing Tripp, who is far too old to be riding a school bus, not his character in Monster Trucks, who is written as a 16-year-old, maybe 17 tops. But Till does not look 16, nor 17, nor even 18. The sight of him riding a school bus does not register the intended pathos (though any comedy, intentional or not, registers loud and clear). It is embarrassing, yes, but not for the reasons the movie wants it to be. On some level, the filmmakers behind Monster Trucks must have recognized the ill fit of Till playing a teenager, because they cast Jane Levy, a 27-year-old who can pass for younger but not a decade younger, as Meredith, a nerdy classmate of Tripp’s who moons over him as she insists on making an appointment to tutor him in biology. For some girls, this might be a come-on, but Meredith, despite her obvious crush on Tripp, really does want him to get better grades. Both twentysomething teenagers get a different and deeply stupid sort of bio tutorial when a Texas oil man (Rob Lowe) drills too far and unleashes a small group of undiscovered creatures, and one of them hides out in the junkyard where Tripp works. The creature, which Tripp imaginatively nicknames Creech, is the kind of rubbery, wide-mouthed, tentacled CG creation that should by this point come free with any visual effects software. Creech is flexible enough to hide inside of the old truck that Tripp is fixing up, and Tripp discovers that, with the right tweaking, the oil-guzzling Creech can actually power that truck from the inside. Mechanically, operating this hybrid vehicle is sort of a cross between driving a car and taming an animal, which means the movie treats the audience to the sight of a man (pretending to be a teenager) driving a literal monster truck in a field next to a woman (also pretending to be a teenager) riding a horse. Whatever else can be said about Monster Trucks, it offers a strikingly peculiar version of hokey Americana. Recycling Americana through predigested pop culture makes Monster Trucks seem indebted to Amblin movies of the ’80s, by way of the boy-and-his-car riff on those same movies Michael Bay half-assedly performed in the first Transformers. But the true reference point here may really be any ’90s-era “extreme” ephemera. When Tripp holds his red soda like it’s an ice-cold beer, it probably isn’t actually Mountain Dew Code Red, but it might as well be. The movie tries to have it both ways with its hero, portraying him as an outcast yearning to escape his sleepy small town whenever he’s not inspiring pants of admiration from Meredith, or Sam (Tucker Albrizzi), a younger kid who idolizes him. If anything, Tripp should have even more fans, hoping that he can buy them alcohol or possibly get them an internship. Eventually, Monster Trucks sends its heroes racing against an evil corporation, on a mission to save Creech, his family, and the environment in general (which makes Creech’s appetite for sweet, sweet oil an especially puzzling detail) and to prove that car chases in kids’ movies can still proceed with the casual disregard for human life that adult audiences demand. In addition to racking up what looks like a substantial offscreen body count, the movie at one point offers an eight-second introduction for a sleazy used-car salesman character for the sole purpose of justifying Tripp and Creech laying waste to his inventory. Then, for good measure, the movie splatters him with paint. Take that, walk-on character with no reason to exist! And yet Monster Trucks, in all its stupid, misguided, laughable anti-glory, is difficult to hate. Its stupidity is, at times, vaguely likable, and if not redeemed by strong craft, not harmed by technical deficiencies. The cinematography, by Don Burgess (of Spider-Man, The Muppets, and several Robert Zemeckis movies), is better-looking than it needs to be, and director Chris Wedge maintains an animator’s warmth and affection for his subjects even when they don’t come from his pen or hard drive. Till is somewhere on the Hemsworth spectrum (more engaging than Liam; not as charismatic at Chris), but Levy is wholly charming as his enthusiastic sidekick. This is not a good movie, and for supporting actors like Amy Ryan, Danny Glover, Barry Pepper, and Thomas Lennon, it may even be an embarrassing one. But it’s not a full-scale humiliation.